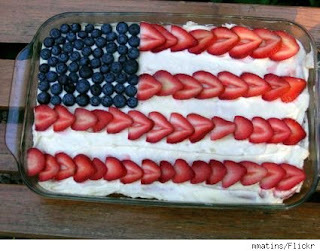 Simply Southern Girl: Patriotic Cake!! So, friends tell me yesterdays cake, while adorable was a bit on the overachiever side. So today I give you how to top any patriotic cake Simply start with a white icing of your choosing, add slices of strawberries for the stripes, and blueberries for the star section of the flag, and viola you have yourself a masterpiece!